I have to thank you (and your cohorts) for the awesome ds106 assignment bank. My digital media students and I have been using it as an absolutely vital resource since the beginning and it continues to delight and amaze. Thanks for building and maintaining a terrific learning/teaching tool. I love it! Yesterday I got the above email from one of my WordPress plugin writing heroes who will have to remain anonymous for now because I was too impatient to wait to get permission to name him 😉 It’s really cool to see how an idea dreamed up by Tom Woodward became a working model built by Martha Burtis and is now abstracted as a theme for WordPress coded by Alan Levine that soon anyone can download for free. 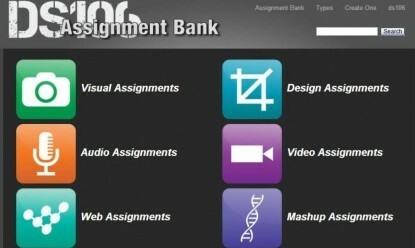 The assignment bank is, for me, probably the most impressively participatory element of ds106—and I think it can easily be re-imagined for a wide range of applications beyond digital storytelling. Mike Caulfield is doing just that with his innovative, cross-instituitonal experiment Water106. It’s nice to think there’s a school out there somewhere that may not necessarily be part of the community, but is having fun with the assignment bank—that’s the whole idea! And it’s even cooler to think such a model could propagate at a thousand different schools populated by hundreds of thousands of students with millions of assignments 🙂 The web contains multitudes, which is distinct from massive in some important ways. This entry was posted in digital storytelling and tagged assignments, ds106, Martha BurtisAlan Levine, Tom Woodward. Bookmark the permalink. Is there a way to create individual assignment banks in different courses/colleges and then allow people to search across them and maybe even build their own custom categories out of shared assignments? I know there are different ways to do this with Open Object Repositories and things like that, but many of those don’t allow student submissions. This may already be built in, but the idea of a connected decentralized network of assignment banks that allows for searching, sharing, reusing, and student assignments? That would be cool. Or maybe it is already there and I just haven’t dug in deep enough? I’m imagining, for example, a scenario where there is a class assignment that a student has a creative idea for, but no way to turn it in for that class. So they search the repository, find one they like, and submit it to the instructor for consideration. The instructor likes it, so they add it to their assignment back with a click. Or, for another example, an instructor is putting together a class and comes across the ds106 bank and thinks “this 100 assignments would be great, but I need them in these categories because my topic is different.” With a few minutes of clicks, they have all of them in their bank with custom categories. And just other mix and match ideas like that.